There are many different coding schemes to collect and discern semiotics, and included in that is my METTA method created as part of my research on nonverbal communication. You can decide the value of METTA after reading [here]. As important as a coding scheme is, I have yet to find one that is complete and encompasses the entire semiosphere (the ‘signs’ that are all around us) that at the same time is not overbearing and time consuming. Sure, for example, METTA helps identify all the nonverbal signs but even this is incomplete for a thorough analysis when used solely for denoting specific (digital) or variations (analog) of nonverbal cues and elements. Simply denoting the sign, a gesture for example, is a start but by no means an end. The connotation of the sign, the gesture in this case, is necessary for a full understanding. Luckily for me, Jakobson is in my corner with this as he states, “It is not enough to know the code in order to grasp the message… you need to know the context” (Chandler 2002, 182). The 3 C’s compliments the METTA method the study of semiotics and nonverbal communication. 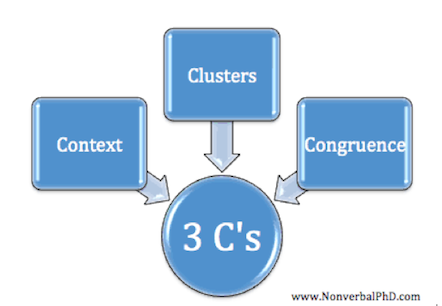 The 3 C’s represents Clusters, Congruence, and Context. Combining this analysis along with other coding such as Morris’s Model (as discussed here) or METTA will help a semiotician understand all nonverbal signs that are present during an interact. Clusters: Although identifying, or denoting, individual nonverbal signs is important, realizing they do occur in a vacuum and contrastly exist in conjuction with other nonverbal signs contributes to a proper analysis. An example includes determining someone is uncomfortable not solely on lack of eye contact but in addition the shoulders are slumped, the person is fidgeting with their wedding ring, and uttering repeated “umms” while answering a question. Congruence: Something important for people interested in the semiotics of nonverbal communication is the words spoken. Yes, nonverbal communication research explores the role of all the various nonverbal elements and cues but it does not do so at the expense of the verbal content. Congruence reminds the semiotician to consider the nonverbal actions and elements along with the words being spoken. An example of congruence is stating you are willing to help someone with an assignment and you move your seat closer to them to look over the work they had already done. Here, your words of offering assistance are congruent with your movement. An example of incongruence is when asking someone if they are upset and they respond “I’m fine,” however their statment is in a sharp, quick tone; their brows are tense as are they lips; while their arms are crossed across their chest. Do you think they are “fine”? Most of us have heard the statement that over 90% of communication is nonverbal, right (read more on this here)? It is true, however in certain situations. It it is referring to situations like the example I just provided- where the spoken words are not congruent with the person’s nonverbal actions. In situations like these, the nonverbal actions consistently tend to be more truthful. Context: The context involves the environment the interaction is taking place as well as the history between the people, and the power structure. Context can give the same gesture, say finger pointing two completely different meanings. In one context, it can be part of anger or scolding, while in another it can represent acknowledging someone. See the photo below and I would bet, regardless of culture, you can differentiate between the two.